New “Who” announced: Matt Smith is the 11th Doctor! Smith will officially take over the role when the fifth series of the show debuts in 2010. Until then, popular David Tennant will continue to star in the title role in a series of specials through 2009 and early 2010. It is expected that the famous “regeneration scene” — in which Tennant’s 10th Doctor will “die” and transform into Smith’s 11th Doctor — will take place in the conclusion of a two-part special that will be broadcast in the UK for the Easter holiday in 2010. 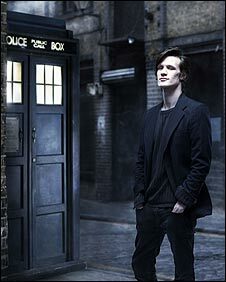 The announcement of Smith’s casting was made during a special episode of “Doctor Who Confidential” on BBC 1 on Saturday. Smith, who will be the youngest actor to ever play the approximately 1,000-year-old Time Lord, has coincidentally appeared in three series opposite former “Doctor Who” companion Billie Piper (Rose Tyler) — “Ruby in the Smoke”, “The Shadow in the North”, and “Secret Diary of a Call Girl”. Following Tennant into the Doctor’s TARDIS will be no easy task for Smith. Tennant, who has starred in the titular role since a 2005 Christmas special (“The Christmas Invasion”) has become arguably the most popular actor to ever play the character, even surpassing perennial favorite Tom Baker, who starred as the floppy hat/long scarf-wearing Fourth Doctor from 1974-1981. This could be a potentially horrible move or it could be a master stroke, i’d hate to say but only time will tell. No one ever really gave Colin Baker a chance and now he has been voted as one of the most popular doctors thanks to his audio work and the few good stories he was given on tv. Baker was highly underrated so i will not do the same to Matt Smith, simply put if he can do it well more power to him great you have my support, but if he can’t then he may become the second Doctor in history who gets the Sack. Personally i hope he can do it i just hope he has a style that makes him look less like an emmo no offense to those emmo’s out there but there is no way on this earth the doctor should be an emmo. Anyways Time will tell good luck that man you will defiently need it.